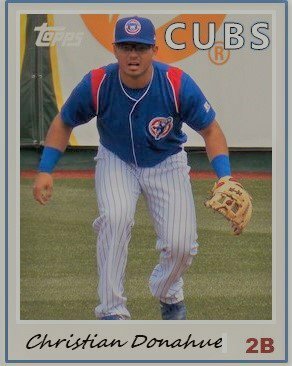 Last year at this time, South Bend Cubs’ infielder Christian Donahue had just been suspended for the College World Series. Donahue had been an integral part of the team for three years playing a mixture of left field and second base. The University and head coach Pat Casey only stated the Donahue had violated team rules. No specific cause was listed for his suspension. Donahue originally matriculated to Oregon State from his native Hawaii where he was a four your letter winner in baseball during high school. His father, Tim, actually played three years in the Indians minor-league system. As a freshman in 2015, Donahue made 47 starts and appeared in 51 games hitting .287 with a 323 on base percentage. He spent most of his time playing at second base. It’s rare for a freshman to get that much experience at a D1 school, especially one as good as Oregon State. In his sophomore season in 2016, he made his way to the outfield and hit .339 with a .393 on base percentage. Donahue was named a first team All Pac-12 honoree. He was a spark plug for the offense despite his 5’7″ and 165 pound frame. In 2017, Donahue earned all academic honors during his junior year but struggled on the field. His batting average sank 82 points to .257 but his on-base percentage was still decent at .339. The timing of his suspension was quite hard as it coincided with the draft and was just before the College World Series. After the suspension, Donahue had a couple of choices. He still had one year of eligibility remaining. He could’ve bet on himself to go back to Oregon State or another school, or he could try to sign on with a major league club. His first official action came for South Bend in April this year. It was not a good month for him. He only saw action in six games before minor injuries put him on the seven-day DL. However, he has been on a tear since he came off the DL in the middle of May. Just last week he went 14 for 27 and earned Cubs Central’s Hitter of the Week. Heading into today’s game he’s hitting .467 for the month with an ungodly OPS of .867 and not a single homerun to his credit. What I really like about Donahue, aside from his hitting, is he’s solidified the right side of an error-prone defense and how hard he plays. He is all action, all the time. Whoever that guy was that played in April and hit only .118 does not resemble the Christian Donahue of May in any form or fashion. This guy plays hard. There is definite talent there and I like the fact that he is only hitting left-handed after being a switch hitter in college. The only other transition he seems to have made from college is he is playing just second base only. In looking at a few of his peripheral stats, he has a K rate of just 17% but his walk rate is low at just 5%. I like that he doesn’t strike out a lot, but he doesn’t walk much either. He is killing right-handed pitching at a .356 clip. Against lefties, he’s doing fine there too with a .286 average. I’m excited to see where this goes this summer. If Donahue can maintain the enthusiasm with which he plays, good things could happen for him this summer. 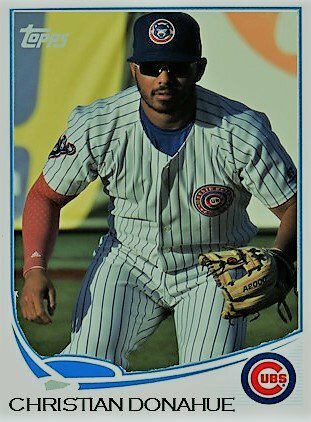 He is locked in at second base for the Cubs for a while. I’m excited to see how he he improves both as a defender and a hitter. Next ›Prospect Update: Is This Bailey Clark’s Year?